Issue permits, and conduct inspections for the construction or repair of onsite wastewater treatment systems. Routine maintenance is required on ALL onsite wastewater treatment systems to ensure they operate properly. Even a conventional, or gravity, system with a standard septic tank and subsurface seepage field requires periodic pumping to operate properly. The pumping of the tank(s) is required to keep solids from entering the soil treatment area. If solids are not pumped out on a routine basis, they will leave the tank and accumulate inside the septic field or soil treatment area (trenches, mound, at-grade, seepage bed, etc). If solids leave the tank, the treatment area will not perform as designed and the effective life of the onsite system could be substancially reduced. Below you'll find some basic maintenance information and documents for specific onsite systems. If you do not know details on your particular system, please call us at (630) 553-8026. Our staff can review permit records and discuss your specific system with you. We can also link you to a service provider for your particular system type. The system shall be evaluated a minimum of once every 5 years for a residential property or every 3 years for a non-residential property. The tank and all of the compartments of the system shall be evaluated to determine if scum and settled solids are greater than 33% of the liquid capacity of the tank. If the layers of scum and settled solids are greater than 33%, the tanks and compartments shall be pumped out and maintenance shall be performed. Depending on use, tanks & compartments may need to be evaluated and pumped more frequently. 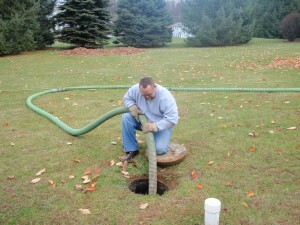 If the system contains an effluent filter in a septic tank, annual maintenance is required. ATU’s require an evaluation and maintenance at least every 6 months. The homeowner of an ATU may conduct the inspection and maintenance, but the inspection and maintenance shall be performed per the manufacturer’s requirements to assure proper operation. If the required inspections and maintenance are not performed, the system is in violation of the Illinois Department of Public Health Private Sewage Disposal Licensing Act and Code.